Rush to Judgment! | Look Out Scarborough! Yes, friends, just when you thought it couldn’t get any worse, it does. Much worse, in fact. The Town Council is on the verge of adopting an accelerated schedule for the second vote on the school budget. Incredibly, it is a schedule which will not even allow enough time for the three local newspapers to publish the amount of the school budget being voted on prior to the date of the vote! So much for having informed voters! Additionally, the “compressed schedule” will severely restrict early/absentee voting. This is especially troubling in that about 25% of the votes in the first school budget referendum were cast as early/absentee votes. What possible reason can the Town Council have for this absurd schedule? Other than a nefarious possibility or two, we can’t think of one. State law governs the school referendum process. According to the law, our second referendum can be held anytime between June 19 and July 24. There is absolutely no legal requirement that an approved school budget be in place by July 1 (the start of the schools’ fiscal year). So why is our Council proposing the June 30 date, which severely limits voter access to information and minimizes early voting opportunities? We wish we could explain it. That’s right, there are exactly three business days between the Council’s adoption of the final school budget amount and the referendum on that budget. I don’t know about you, but when somebody puts an unrealistic time deadline on me to decide something, it sends up major red flags. This unholy rush to pass the school budget strongly suggests there’s going to be something in it that folks won’t like when they finally see and understand the details. The unreasonable schedule in itself may just be enough reason to vote against the school budget if the Council insists on a June 30 vote. Transparency? Informed voters? Adequate time for early voting? Obviously these are not concepts that the Council values if they continue with this headlong rush to a June 30 voting date. 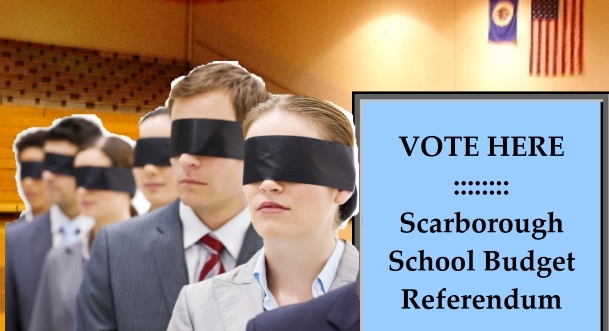 If you can do it before their 9 am meeting on Tuesday, June 16, email the Council members and tell them to respect the right of Scarborough voters to be adequately informed about the school budget before having to vote on it. Three business days between Council approval and the referendum is obviously inadequate. The email address that will reach all Council members is: scarboroughtowncouncil@googlegroups.com. We have purposely kept this posting short and focused. 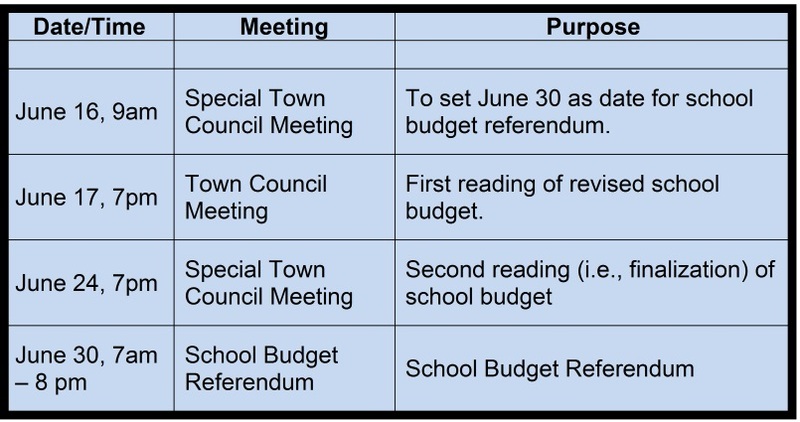 If you have a couple of minutes now, please consider a quick email to the Town Council indicating your strong objection to a referendum schedule which (1) makes it nearly impossible for voters to become informed about the revised school budget and its tax implications and (2) severely constrains early/absentee voting opportunities. Next time we will also be able to report on the “first reading” proposal for the school budget at the June 17 Council meeting. (Our best guess: a reduction of $250,000 to $350,000, an amount which will still keep the increase in taxpayer funding of the schools at more than 7%.) We also have several interesting tidbits about Town Hall goings-on that we decided to hold over until the next blog. This entry was posted in Uncategorized on June 14, 2015 by Site Author.